For couples wanting unrestricted luxury and a completely exclusive venue for their wedding celebrations, this Private Estate in Orange County offers the best of both worlds. Rather than being whisked from your getting ready hotel to your wedding ceremony, before a couple portrait shoot elsewhere then transfer to your reception celebrations, a wedding at a Private Estate in Orange County allows everything to happen at the one location. Not only does this reduce stress and allow you to really soak in all the moments, but opens up more time for beautiful wedding day photography. Holding your wedding at a Private Estate in Orange County allows you to be in full control of the day and schedule. From deciding when you want to walk down the aisle to the time that you want the party to end (rather than conforming to noise constraints), a private estate wedding enables you to call the shots. You can get ready in one of the Private Estate in Orange County’s massive suites, with natural light pouring through the windows and plenty of space for your extended bridal party. Then walk down the garden aisle in the magical late afternoon light, surrounded by gorgeous florals and a personally-selected bridal arch. This magnificent venue comes with countless beautiful locations for couple portraits, ranging from lush landscaped gardens to distinctly glamorous interior features. While your guests are enjoying cocktail hour you can really take your time during the photo session, with no strict limitations on where you have to be and when. 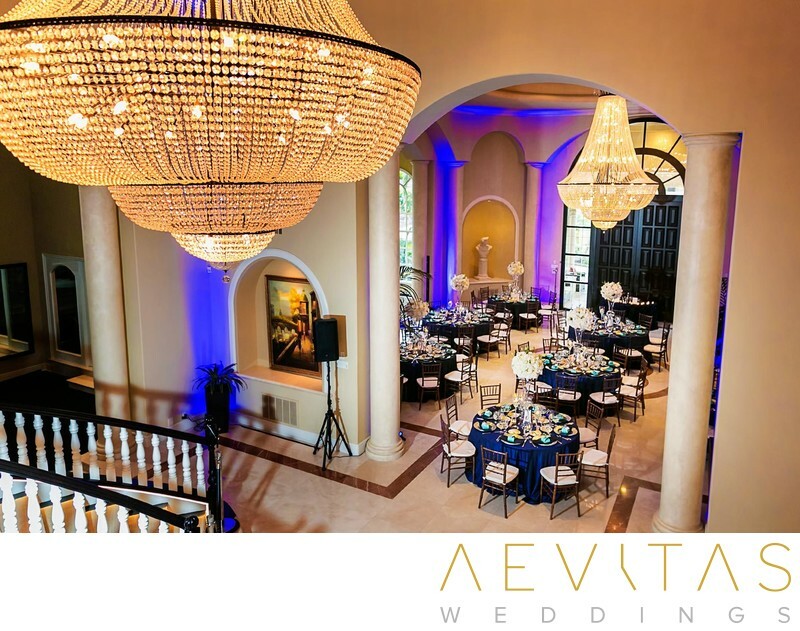 Receptions are held within the Private Estate in Orange County’s luxurious main ballroom, with space for a huge dance floor and even a live band. Catering and beverage options are completely up to you, allowing you to customize your wedding day menu down to the tiniest details. Hosting your wedding at this Private Estate in Orange County is the opportunity to treat your family and friends to a day they will never forget at a venue that is truly stunning. But to execute a stress free and smooth-running wedding here, the services of a wedding planner cannot be overstated. Allow a professional with years of experience in private estate weddings to handle all of the logistical details and help create a day that fulfills all of your wildest wedding day dreams.